O.C. 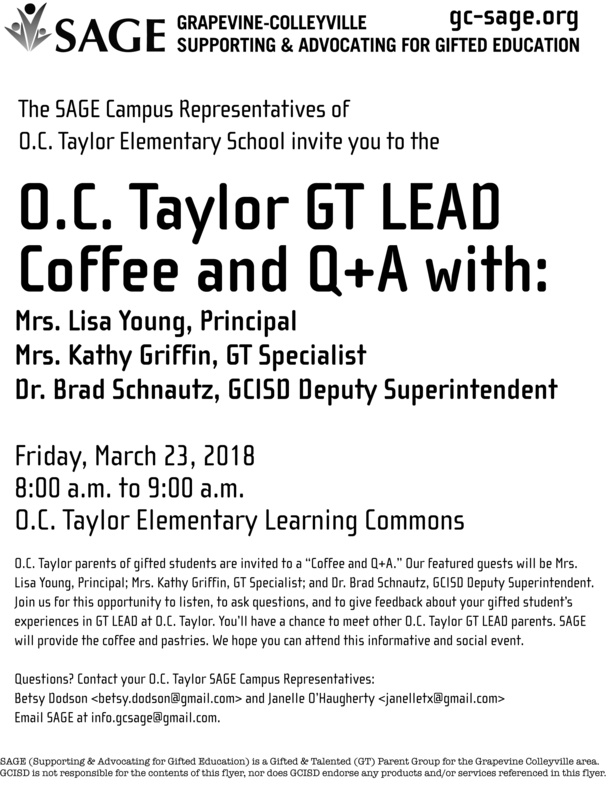 Taylor parents of gifted students are invited to a “Coffee and Q+A.” Our featured guests will be Mrs. Lisa Young, Principal; Mrs. Kathy Griffin, GT Specialist; and Dr. Brad Schnautz, GCISD Deputy Superintendent. Join us for this opportunity to listen, to ask questions, and to give feedback about your gifted student’s experiences in GT LEAD at O.C. Taylor. You’ll have a chance to meet other O.C. Taylor GT LEAD parents. SAGE will provide the coffee and pastries. We hope you can attend this informative and social event.